You are diligent about outfitting your dog with a collar and ID tags, and your cat remains indoors at all times – nothing to worry about then, right? Unfortunately, accidents can happen to even the most conscientious pet owners. Collars can break or fall off and doors can be left open. The only permanent form of identification in the event that your pet goes missing is a microchip. Together with the American Veterinary Medical Association (AVMA) and the American Animal Hospital Association (AAHA), we are celebrating National Check the Chip Day on August 15th. While we promote responsible pet ownership every day of the year, National Check the Chip Day is a day to spread awareness about the benefits of microchipping your pet and the importance of keeping microchip registration information up-to-date. A microchip is a small, implantable computer chip that contains a unique identification number. The chip is about the size of a grain of rice (12 mm) and is implanted beneath the surface of your pet’s skin between the shoulder blades. The implantation process is fast and painless and can be done at any office visit. In fact, it’s very similar to getting a routine vaccination. Once your pet is microchipped, he or she has a permanent ID for life. At Leesburg Veterinary Hospital, we use HomeAgain microchips. These microchips are made from biocompatible materials that will not move or degenerate over time. They are not tracking devices and do not require a power source like a GPS. Rather, they use radio frequencies to identify pets. When a microchip scanner is passed over your pet’s shoulder blades, the scanner emits a low radio frequency. This frequency is not harmful in the least but provides enough power to transmit the microchip’s unique ID code and positively identify lost pets. We strongly recommend microchips for all of our patients – including indoor cats. According to HomeAgain, a recent study showed that less than 2% of lost cats without microchips were returned home. However, the return-to-owner ratio for microchipped cats was 20 times higher than non-microchipped cats. Scheduling your pet’s microchip implantation and keeping your information up-to-date! Since the microchip implantation process is similar to getting a routine vaccination, it can be done when your pet is here for their annual exam, or it can be scheduled as a quick technician appointment. Many of our clients also choose to have their pet’s microchipped when they are puppies and kittens during their spay and neuter surgery day! When your pet is microchipped at LVH, we’ll have you fill out a form that contains your pet’s microchip ID and your contact information. We’ll send this information into HomeAgain for you; automatically enrolling your pet for one year. According to HomeAgain, less than 50% of microchips are ever registered by pet owners, which is why we don’t mind taking care of the initial registration for our clients. However, once your pet is microchipped, it’s extremely important that you visit HomeAgain’s website, set up an account, and keep your pet’s profile and your contact information updated. Each pet will have their own page where you can add descriptions such as fur coloring and markings, medical conditions, and a photo. The information listed on their pet profile page will be used in lost pet alerts. It’s also important to keep your most up-to-date phone numbers, emails, and home address listed. If you move, you can even update your primary veterinarian’s information. To get started with a HomeAgain account, click on the “Member Login” tab on top of HomeAgain’s homepage. Next, you’ll be asked to enter your pet’s microchip number, and the information you entered on the form at the hospital (As shown in the photo below). And that’s all there is to it! After the first year, HomeAgain will contact you by email to renew the annual membership. The cost to renew is $17.99 a year – we think this is a small cost to pay for the safety and security of our pets! 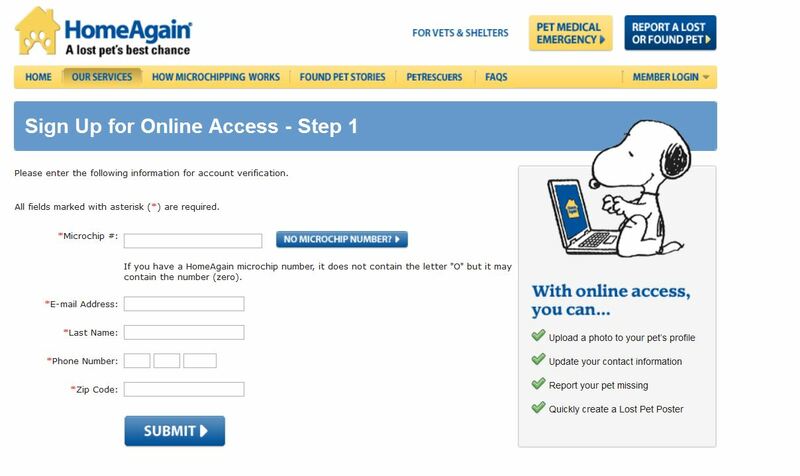 If pet owners decide not to renew their annual membership, their pets’ microchip ID codes and information will remain in the HomeAgain database for life, and contact information may be updated online anytime. Just remember, if contact information isn’t updated, a found pet cannot be returned to their loved ones. Signing up with HomeAgain is easy and extremely important in getting your pet home safe and sound should they ever go missing. A permanent listing of your pet’s microchip ID and your contact information is added to HomeAgain’s National Recovery Database. When a lost pet is scanned, the ID number is called into the pet recovery database. Almost all veterinary practices and animal shelters use scanners that can read these codes, so you’re pet can be identified no matter where or how far away from home they are found. As soon as a pet is reported lost, HomeAgain sends a lost pet alert with your pet’s information and photo to members of the HomeAgain Pet Recovery Network within a 25 mile radius. This network includes over 1,000,000 veterinary practices, animal shelters, and volunteer Pet Rescuers nationwide. HomeAgain loves happy reunions and wants to ease the burden of expensive travel costs associated with reuniting pets with their families. Annual membership includes coverage up to $500 in pet airfare if a pet is found over 500 miles away. One of the nicest perks of HomeAgain’s annual membership includes free, anytime telephone assistance to ASPCA’s Emergency and Poison Control Center Hotline. This is a great resource – we recommend this hotline to all of our clients during our closed hours anyway. Under normal circumstances, each call to the hotline costs $65.00. However, as a HomeAgain member, all calls are free. (We charge $61.00 for the microchip and first year of membership, so one call to the hotline pays for itself!). If you are interested in learning more about microchips and HomeAgain’s services, check out their informative FAQ page, then contact us to get your pet microchipped today! ← Service and assistance dogs work hard, help people lead fulfilling lives.